These dslrBooth™ Photo Booth Printer & Software Bundles make it easy to get started in the Photo Booth business. 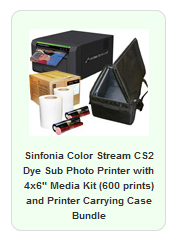 The Dye Sublimation printers feature fast printing speeds and high capacity output. The variety provided will ensure that you can find the perfect photo booth or event printer setup that is right for you, they cover the range from the light and portable to stackable. 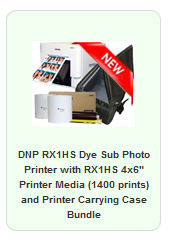 Foto Club offers a great selection of photobooth, photo printers, software, and printer accessories for the small business owner. Find out more about how to start your own printing business.